Yay! Today we get to actually sew something! Let’s get started. 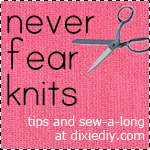 I’m using my serger but remember you can always sew knits on your regular sewing machine. Before you get started it’s a good idea to take a scrap piece of fabric to test your machine’s tension. Avoid seam ripping with a little prep work! Pin the bodice pieces together at the shoulders and side seams. Next stitch both side seams. For the shoulder seams – you don’t have to use Stay Tape but I love this stuff so I’m using it. If you don’t have any but would still like to support your shoulder seams you can use a bit of clear elastic instead (which you already have because you need it for the waist seam). Simply lay a strip of elastic/stay tape on top of the fabric edge and stitch over all three layers. If you are using a serger you can leave your “tails.” If you are using a sewing machine go ahead and trim the extra threads. Now on to the skirt. Pin the skirt at the side seams and stitch just like with the bodice. I didn’t have enough fabric for two whole skirt pieces and I had to cut two halves for the back. So I have a center back seam on my skirt. One thing to note – it’s easy to see which side of the printed fabric is the wrong or right side. However, if you are using a solid color, single knit fabric (like my black jersey) look closely to make sure you know which side is which. It may not be noticeable while you work with the fabric but if you stand back you might be able to see a difference. For example, the right side of my jersey almost has a sheen to it and the wrong side is more matte. I’ve used a sweater knit before where the wrong side was slightly darker than the right side. You don’t want to go through all that work only to find out one of your pieces is facing the wrong way! Remember, the right side has visible vertical lines. ***Tomorrow we’ll attach the sleeves and sew the waist seam. Happy sewing! Previous Article← Never Fear Knits Ballet Dress Sew-a-long Begins!